Park Shin-Yang (left) dances with Kim Jung-Eun in a local TV drama "Sweetheart in Paris," which was broadcast in recent months on SBS TV. Photo caption by Gale (Ga-Young) Lee. TV networks have routinely air programs that promote tourist destinations into living rooms. These programs are packed with embedded ads as product placements known as PPL which is a process integrating an advertiser's product into movies and TV shows for clear, on-screen visibility. This latest ad trend has been in vogue since the late 1990s. Leading the bandwagon are foreign national tourism organizations (NTOs) or travel agents amid ever-increasing number of Korea's outgoing tourist agents. Korea's entertainment celebrities including pop singers and TV actors and actresses are being used as PPL linked with foreign travel destinations or appointed what is popularly called as tourism promotional ambassadors for foreign NTOs. Major success stories associated with PPL marketing are "An Affair in Bali," local TV soup drama series filmed in the Indonesian resort island of Bali and "Sweetheart in Paris," another TV series with background of Paris. 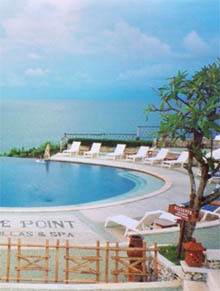 The two TV series did play a role respectively in promoting Indonesian resort island of Bali and Paris as popular tourist destinations for Korean travelers directly and indirectly. Overly use of such an embedded advertising as PPL and other veiled commercial pitches are under public criticism nowadays. "It is true that PPL formula and other 'star marketing tactics' have brought about successful results but more advertisers realize now that PPL is not always so effective marketing tool," said a marketing specialist. advertisers who pretend that these are just ordinary programs rather than paid ads. He noted that more TV audience complain of the current TV advertising practices regarding embedded advertising that is an affront to basic honesty. A marketing manager at a foreign NTO in Seoul said that PPL is still very attractive tool of marketing but some NTOs in Seoul are looking for other marketing tactics other than PPL. An official at Hong Kong Tourist Association office in Seoul maintained that more important than PPL is contents of the TV drama. "If and when TV drama series feature crime and violence with the background of a certain travel destination, for example, it would come as a disaster for the destination used as PPL," he said. "Just imagine when Hong Kong is used as PPL and drama series are associated with crimes and violence in its content," he said. He pointed out those risky factors involving PPL marketing tactics when it misfired. That is why more and more NTOs are reluctant to become sponsor of the local TV dramas unless concept of the series is fit for image of destination, he added. In fact, "An Affair in Bali" was a big success as far as Bali is concerned but image of Korean travel trade industry was badly tarnished as a whole because of negative description of Korean travel companies in the TV series. "Tourism Swiss," however, is still affirmative about PPL formula. Its sponsorship of top Korean TV celebrities Choi Soo-Jong and his wife Ha Hi-Ra in production of PPL TV commercial and appointment of TV actress Chang Na-Ra as tourism ambassador turned out to be big success in promoting Switzerland. Thanks to these marketing activities, Switzerland is emerging as a key mono travel destination for Korean tourists, they said. Success of PPL and other star marketing tactics largely depend on marketing concept and other professional factors, a marketing specialist said. "Tourism Swiss" plans to come out with more aggressive marketing tactics aimed at Korean market next year. For Southeast Asian and China markets, in the meantime, Korean travel companies intend to take advantage of growing popularity of "Korean Wave" or Korean pop culture. "We intend to utilize such popular TV series in Southeast Asia, Japan and China as Winter Sonata as our marketing tools," a marketing company official said.